When you’re planning out a new house, don’t think of the attic as just another place for storage. It can become a completely livable space and remodeling the office, while challenging, can be relatively efficient when done right. Consider reclaiming the space under your room and turning it into a bedroom. Before you get started, think about how you can extend the house’s many systems to your attic. With enough planning, it’s possible to provide electricity, plumbing, and air conditioning to the room to make it a suitable bedroom. Consult specialists to see if your house systems can handle the additional demands. Once they give you the go-ahead, think about how you can access the attic. A ladder is not sufficient enough, especially if it drops down every time. Adding a staircase will occupy some room below the attic, so consider converting closet space to stairs to provide come-and-go access. It will also do wonders for airing out the rafters. After access has been squared away, it’s time to look for inspiration for your attic bedroom. An awesome aspect of the attic bedroom is that you get to use more of your home’s square footage in the process. If you live in a place like Kitchener and have a great view, it makes sense to plan around a well-placed window. Some homes even have roof windows that can add in a great amount of natural light to the bedroom. Once all the planning is said and done, it’s time to start focusing on the details. Ensure the flooring is more durable and comfortable than just wood. Sturdy carpeting is relatively inexpensive; it will also see very little wear and tear because this area will not be trafficked much. 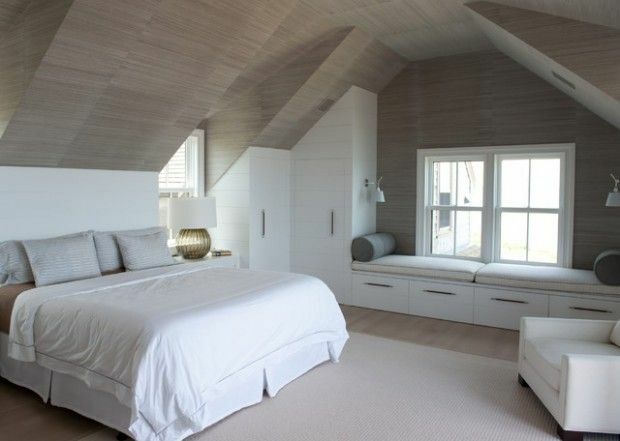 Part of the appeal of an attic bedroom is that you get to embrace the angled walls. However, preparing it can be a challenge. Due to the location and odd room shape, the paint job is a bit more complex. It might be in your best interest to consider professionals to paint around the curves and corners of the room. Additional care is needed for places like Kitchener with plenty of old houses. Though finding local painters in Kitchener may be difficult with a busy schedule, it will be worth the wait. Once the color of the room is settled in, it’s time to focus on the furniture. To make it a true bedroom, add in a queen size bed and a nice, wooden desk. Depending on the space, you may want to add in other accent pieces like bedside tables, bookcases, and lamps. Though it may take some effort to get it up the stairs, hiring a Kitchener moving company to help you get everything upstairs. They will also help you place all of the furniture in the perfect spot. It can be a challenge to personalize every inch of your home. If you think your attic has potential, use this article as a simple starting point to help you plan out the different steps involved with the process.